Coalition for Public Safety: Do Republicans and Democrats really see eye to eye on criminal justice reform? Conservatives and liberals have joined forces to advance criminal justice reform. Can they really work together? Liberals, and conservatives, to the rescue? 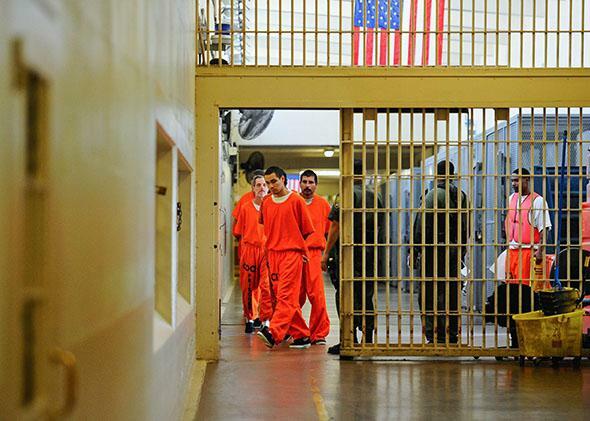 Inmates at Chino State Prison walk the hallway on Dec. 10, 2010, in Chino, California. On Thursday a group of strange bedfellows made news by announcing a new organization that will promote criminal justice reform in Washington, with backing from the conservative Koch brothers and the liberal American Civil Liberties Union, among others. The arrival of the organization—called the Coalition for Public Safety—would appear, at first glance, to be the latest evidence that the polarization of American politics is no match for the growing bipartisan consensus that the criminal justice system needs fixing. At a time when Republicans and Democrats are intractably at odds on most issues, it’s reassuring to see everyone agreeing that it’s shameful for the United States to imprison in excess of 2 million people, and for our sentencing laws to condemn citizens to decades in prison for nonviolent drug convictions. There’s less agreement, however, on why this is shameful. For many Republican reformers, it’s because of how much money mass incarceration is costing taxpayers. Others on the right, in particular libertarians, are incensed because a nation that locks up such a huge segment of its population is hard to see as a paragon of personal freedom. Devout conservatives object because their Christian beliefs incline them toward second chances and rehabilitation. Activists and politicians on the left, meanwhile, have tended to support justice reform for different reasons: Some are bothered by the disproportionate toll the system takes on minorities, while others think the government should be more focused on funding social programs that help members of vulnerable communities avoid being incarcerated in the first place. So far, it has been fairly easy for politicians and commentators to paper over these divergent motivations. Several bills aimed at making the justice system less punitive have attracted bipartisan support in Congress, and many of the likely candidates for president in 2016—including Republicans Rick Perry, Rand Paul, Jeb Bush, and Ted Cruz—have expressed enthusiasm for criminal justice reform. But critics say that underlying the promise of accord lurks a serious danger—that the beliefs and values attracting Republicans and Democrats to this cause are so different that, when it comes to actually passing legislation, the two sides will not be able to arrive at solutions capable of bringing about meaningful change. Right and left have fundamental disagreements, starting with what caused America’s prison population to balloon in the first place. Many liberals would lay the blame on the inadequacy of government investment in public health and education. According to this argument, the prison system grew because it became society’s primary way of dealing with social problems like poverty, mental illness, and drug addiction. Merely shrinking that system, many liberals believe, won’t make those social problems go away. “The conflict comes when you start thinking about what you want to replace mass incarceration with,” said Steven Teles, a political scientist at Johns Hopkins University, over Skype. Teles, who is co-writing a book about why the American right has shifted in its position on criminal justice, said he worries whether pro-reform fiscal conservatives will be willing to allocate tax dollars to pay for creating and improving programs designed to keep people out of prison, including parole and probation. In his “Flawed Coalitions” paper, Jaros points to the last time there appeared to be consensus on criminal justice reform: when liberals and conservatives joined in the early 1980s in support of laws that would limit the ability of individual judges to make sentencing decisions based on their own discretion. The two sides had very different reasons to support the legislation, Jaros writes: On the right, there was a desire to prevent liberal judges from being too lenient, and on the left, there was a desire to eliminate racial discrimination causing minorities to receive much harsher sentences than whites. “I think the liberal progressive community looks back on the shift to sentencing guidelines as one that was largely negative for the population they thought they were serving,” said Jaros. “At the same time, I think conservatives largely saw it as a policy win, because sentences ended up substantially higher. It was a case where there was a shared distaste for a policy but not a shared goal.” Today, Jaros said, we’re looking at a similar situation. I called Christine Leonard, the executive director of the new bipartisan coalition in Washington, and asked her if she thinks there is reason to be concerned about the political future of the movement in which she now has such a prominent role. Leonard, for most of her career, has been aligned with the liberal side of criminal justice reform: Her two most recent jobs were with the Vera Institute of Justice and the Obama administration’s Office of National Drug Control Policy, and before that she served as Sen. Ted Kennedy’s counsel on the Judiciary Committee. In her new position, Leonard is responsible for building bridges between the left and the right, and during our conversation she spoke confidently about finding common ground. One example of such a solution, she said, consists of making sure that vulnerable populations are getting the education they need to succeed. This might mean working to shut down the school-to-prison pipeline, which results in kids getting pulled out of their classes and into the orbit of law enforcement because of disciplinary issues, Leonard said. Or, she added, it might mean giving inmates in prison the opportunity to take college classes for credit so that they can get jobs upon release. Yet fiscal conservatives have a history of being against the use of tax dollars to pay for postsecondary education for inmates, and in the mid-1990s, Republican politicians pushed for legislation that stripped college-in-prison initiatives all over the country of public funding. Is there reason to expect that conservatives in 2015—even those who have dedicated themselves to criminal justice reform—will take a different stance on this, or other publicly funded programs aimed at reducing the incarceration rate? Leonard initially dodged this question somewhat, saying it’s going to be important for the nonprofit community to step up, and for the private sector to lend a hand as well. “There’s a lot of really strong initiatives out there that are important because they don’t involve public spending,” she said. That’s an argument that would resonate with most liberals. Whether the conservatives Leonard will be working with in her role as political bridge-builder can be convinced to see it this way will be a central question as the feel-good vibes of bipartisanship wear off, and the new coalition takes up the deceptively difficult work that lies before it.